A letter sent by Puerto Rico Gov. Ricardo Rossello to the Department of Homeland Security’s inspector general’s office on Wednesday touched off a Twitter feud and later apology by the small Montana-based company that earned a contract to restore power on the island. Whitefish’s relative lack of experience -- coupled with the fact that it is based in Interior Secretary Ryan Zinke's hometown -- has fueled questions about how it secured the $300 million contract. "I request that your office complete its review of the Whitefish Contract so that a final determination can be made as to the Whitefish Contract and address any other issues regarding the same by Monday, October 30, 2017," Rossello wrote in the letter. San Juan Mayor Carmen Yulin Cruz -- a frequent opponent of President Donald Trump -- got into a brief Twitter battle with Whitefish after the governor made the request. She accused the company of "admitting political motivations." "If @WhitefishEnergy feels that asking for transparency is 'misplaced,' what are they afraid we will find," she tweeted. Whitefish responded to Cruz on Twitter and asked if it should send its workers home or allow them to keep working in the city. "We’ve got 44 linemen rebuilding power lines in your city & 40 more men just arrived. Do you want us to send them back or keep working?" Whitefish Energy tweeted Wednesday. Cruz responded with the following statement: "They are threatening not to do their job which frankly is quite irregular for a company hired to the work for the public sector." (Ramon Espinosa/AP) Whitefish Energy Holdings workers stand on towers to restore lines damaged by Hurricane Maria in Barceloneta, Puerto Rico, Oct. 15, 2017. Cruz had called the contract "alarming" in an interview with Yahoo News on Wednesday and said it should be "voided." "The contract should be voided right away and a proper process which is clear, transparent, legal, moral and ethical should take place," she said. Whitefish later apologized for the comments, saying it wished to "make good progress" and help everyone in Puerto Rico. "Mayor Cruz and everyone in Puerto Rico -– on behalf of our employees, we would like to apologize for our comments earlier today, which did not represent who we are and how important this work is to help Puerto Rico's recovery," the company said in a statement. "We have a strong team on the ground, we are working hard and making good progress." Republicans and Democrats on Capitol Hill have also called for an investigation into the contract. Many lawmakers questioned why the Puerto Rico Electric Power Authority had chose to work with Whitefish instead of reaching out to the American Public Power Association, which normally matches states hit by disasters with nearby public power utilities who have offered up crews and equipment. 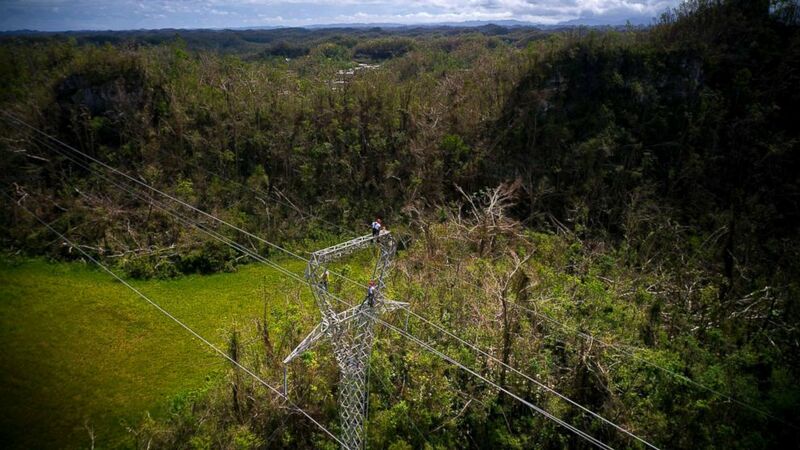 Founded in 2015, Whitefish says it has mobilized a team of nearly 300 subcontractors in Puerto Rico, with more on the way, to help restore the island’s electrical infrastructure in the wake of Hurricane Maria. The company says it called Puerto Rico before Maria hit to pitch its own services. Whitefish "showed up at the right place at the right time and that's how they got the contract," Sen. Marco Rubio, R-Fla., told ABC News. "We want to see restoration pick up. Every day that they're without power is a day that economy isn't functioning and it's another day people are suffering." Rossello said the Federal Emergency Management Agency (FEMA) also had questions about how the Puerto Rico Electric Power Authority had awarded the contract to Whitefish Energy, which had just two full-time employees when the contract was signed, but that FEMA had no comment on the contract at this time because "it appeared to comply 100 percent with FEMA regulations." Only 25 percent of the island has power 35 days after Maria hit the island, according to the governor's office. ABC News' Joshua Hoyos, Erin Dooley and Stephanie Ebbs contributed to this report.